Delicious low carb, protein packed, chocolate peanut butter muffins! 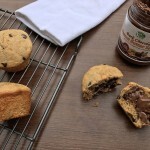 Follow instructions on LC-Chocolate Chip Muffins package, adding 2Tbsp LC-Peanut Butter Powder. Pour into greased muffin tin, about ¾ full. Bake at 375 for 13-15 minutes. Cool for 15 minutes in pan, before transferring to a cooling rack. Once cool, spread LC-Dark Chocolate Peanut Butter Spread and enjoy! Sorry, this is not a review. I couldn’t find a place to ask a question or make a comment. Can you please provide the macronutrients? I still count them all and need them for recipes. Also it sure would be nice if the printed recipe looked as pretty as the webpage. There’s no picture or anything. I like to see what I’m making. We usually just share the approximate net carbs. For this recipe it is approximately 2 net carbs per muffin. It can vary depending on the size you make your muffins and if you use our products or not. I’m sorry that the picture didn’t print for you.